Earth Day Giveaway! 🌏 “As you develop your awareness in nature, you begin to see how we influence all life and how all life influences us.” -Tony Ten Fingers 🌏 In celebration of Earth Day I am gifting two copies of my Nature Prompt bundle - a year’s worth of simple prompts that will nurture your child’s natural sense of wonder & curiosity and cultivate deeper connections to the natural world. 🌏 To enter, leave a comment telling me your family’s favorite outdoor activity. That’s it! For an additional entry, tag a friend you think would like support in fostering a child’s nature awareness. 🌏 I’ll announce the two recipients on Monday. Connecting children to nature through playful experiences. My family and I have been spotting lots of dragonflies – and some damselflies – lately. We have even had the privilege of witnessing some emerge from their nymph skins. We find them so fascinating and beautiful. And we really appreciate their mosquito-eating abilities. My husband, children, and I once all snuggled in our hammock together and watched as a dragonfly swooped over and over picking mosquitoes out of the air. It was a marvelous show! If you are wondering… yes, the nymph skin above came home with us and is part of our nature collection. 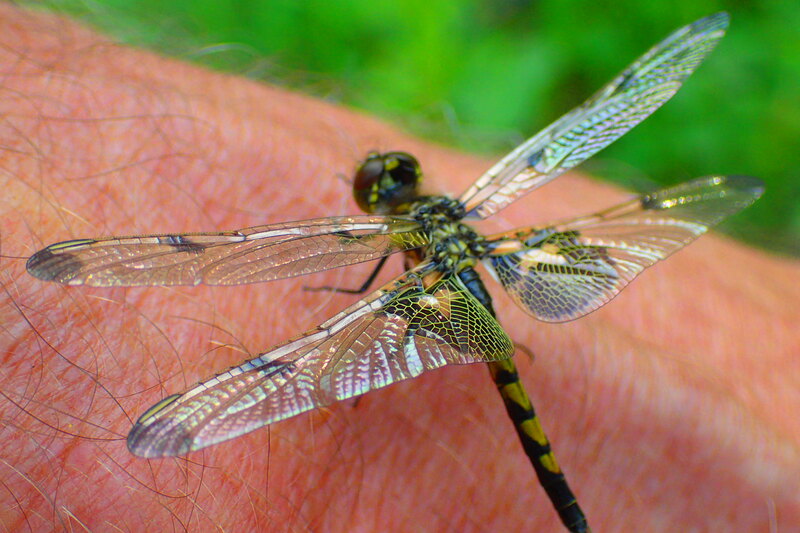 Dragonflies have been around for 300 million years! The prehistoric version of this insect had a wingspan of up to 24 inches. Dragonflies and their cousins, the damselflies, belong to the order Odonata – which means “toothed one”. Dragonflies don’t actually have teeth but do have some strong mandibles! Dragonfly larva are aquatic. This stage can last any where from one to six years. Dragonfly nymphs molt up to 15 times. A dragonfly breathes oxygen through gills located inside its abdomen. Damselflies’ gills are located externally. Dragonflies can fly straight up, down, sideways, and backwards. They can even hover. Dragonflies sometimes swarm – which means flying together in a large group – for either feeding or migratory purposes. 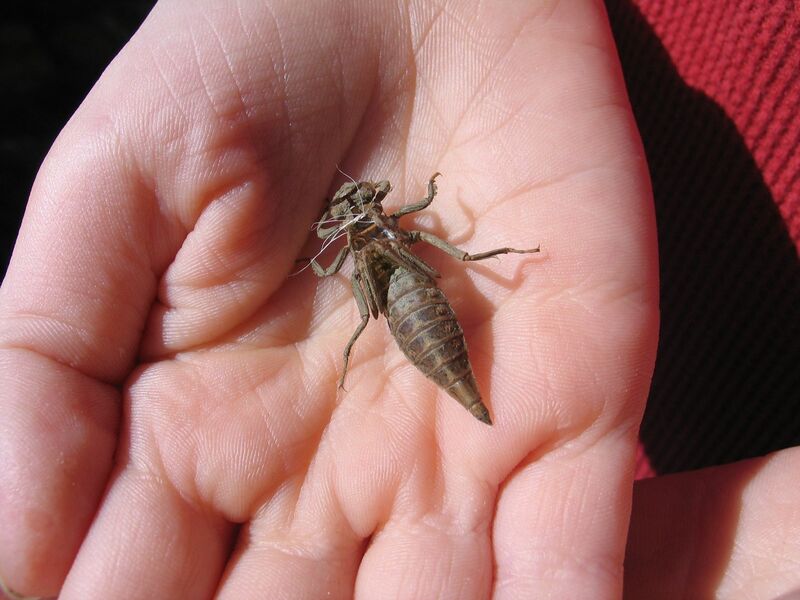 If you are ever lucky enough to see one, visit The Dragonfly Swarm Project and record your observation. Dragonflies are the subject of folklore all over the world, From China to Sweden. Some are more pleasant than others. I won’t tell you what my mother grew up believing. 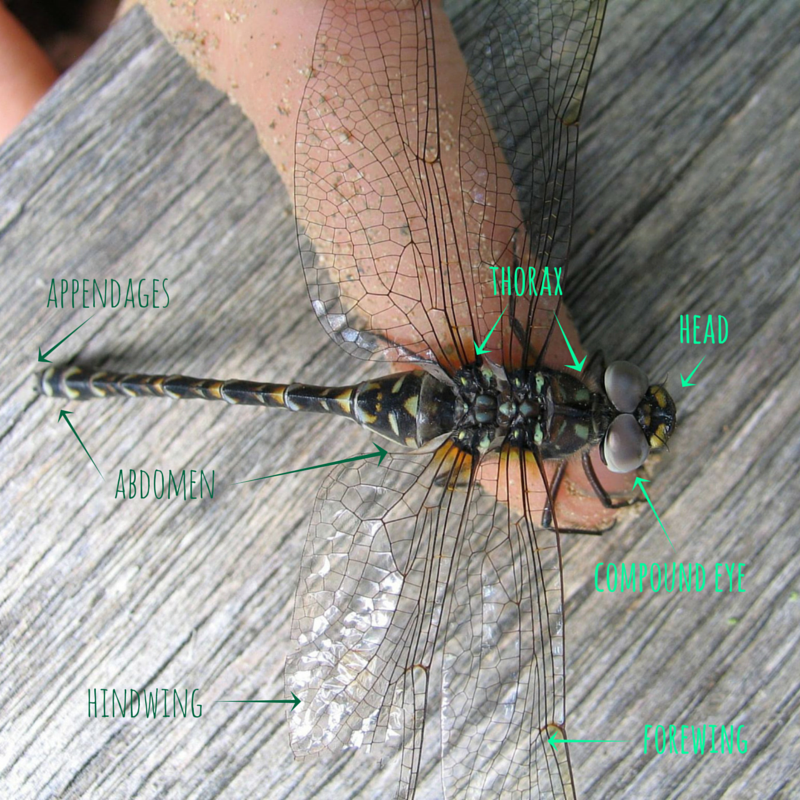 Stokes Beginners Guide to Dragonflies by Nikula et al. 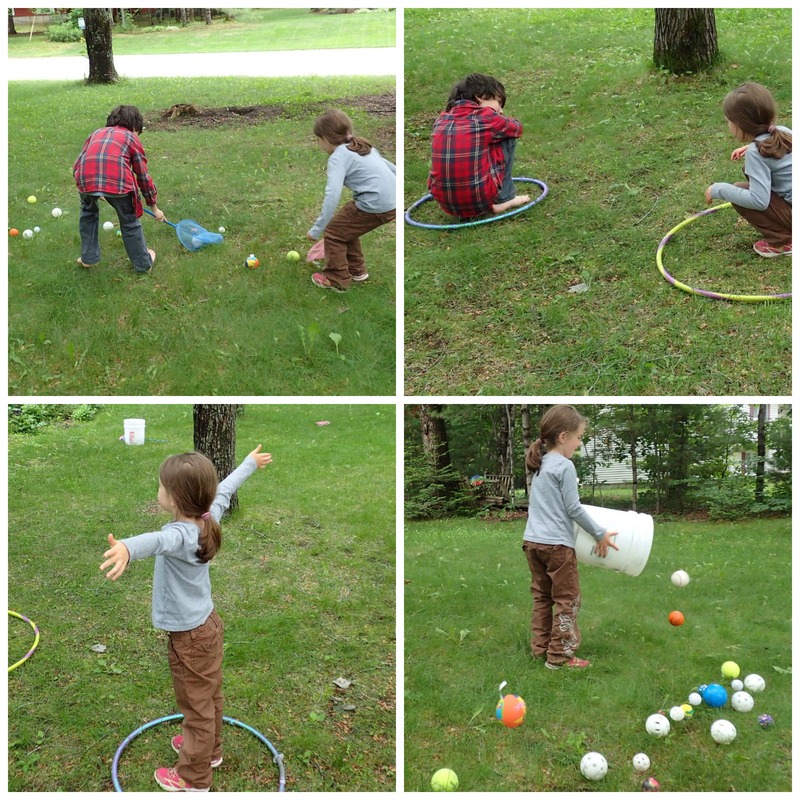 – One area of our yard was set up as a “pond” with prey (which were really various sized balls) scattered all around. My children, pretending to be dragonfly nymphs, used nets to “eat up” prey. Once they had ten in their nets they could crawl out of the pond, deposit the balls in a bucket or bin for later use, and find a place to rest. 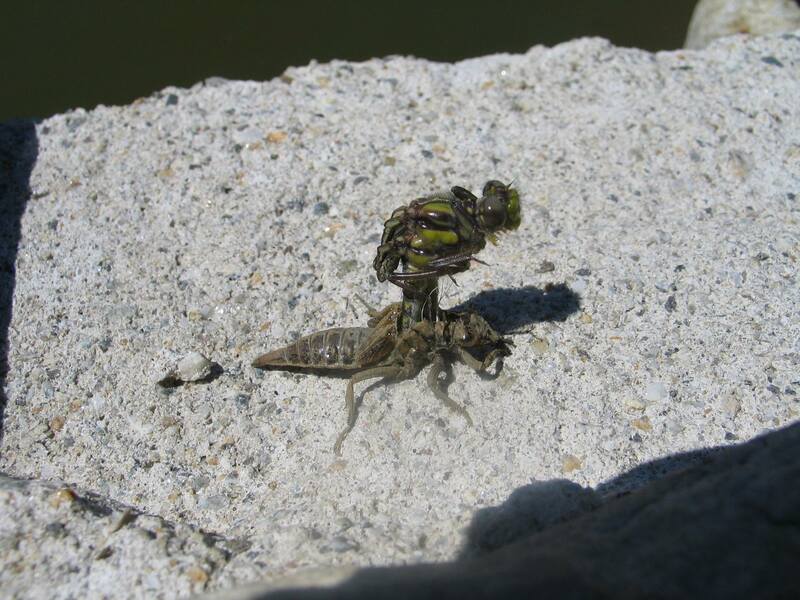 – They scrunched down and slowly rose until they were standing with arms outstretched – which represented the dragonfly emerging from its nymph skin. They could then fly around with arms flapping and start catching mosquitoes (which were represented by bubbles). 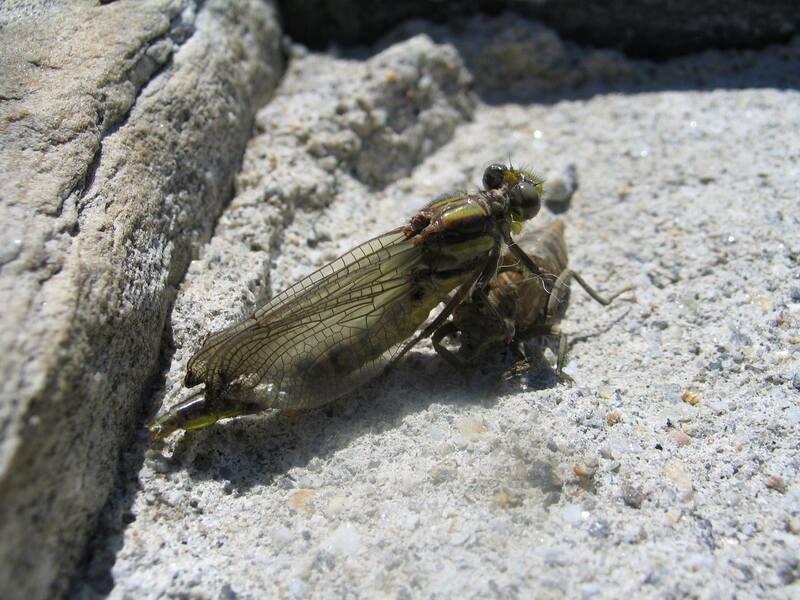 – One dragonfly then flew to the bucket of balls and passed it to the other dragonfly (to represent mating) who then deposited the “eggs” into the pond area. Now the cycle can begin again. You could come up with your own variations of this life-cycle game. For example, my children thought it would be a lot more fun to use a kiddie pool as the pond and to use tongs to represent the nymph’s mask pincers. If you give it a try I’d love to hear how your children enjoyed it and if you made any adjustments. We’ll also be making clay dragonflies to reinforce learning the various body parts. For younger children there are lots of cute and easy dragonfly crafts. You can find a nice collections here. 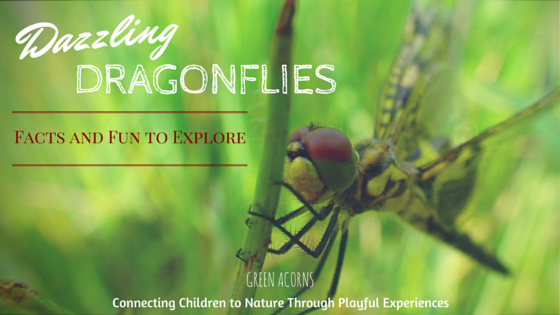 I hope you and your children are feeling inspired to head out for some dragonfly spotting and to learn more about these amazing insects. Don’t forget about recording observations in those nature journals! Just today we saw our first nymph skin and the new dragonfly. It was emerging from its skin as my son spotted it on a tree. The coolest thing ever! Great post! It’s an amazing thing to witness, isn’t it?! Although, the first time we saw a dragonfly emerging images of the movie Alien popped into my mind. 🙂 Thank you for your comments, Tamara!